Kirkbride Airfield was opened in May 1939, it's role was as a storage and maintenance base to keep aircraft safe after being built at various factories before going onto be delivered to a frontline unit. No16 Ferry Pilots Pool of the Air Transport Auxiliary was formed at the airfield because of the number of movements the airfield was seeing during the first years of WWII. Their base was set up in what is now the White Heather Hotel. No.12 MU (maintenance unit) was also set up on the airfield and between 1939 and 1960 they would of dealt with just about every aircraft in RAF service, history shows they ranged from Austers to Liberators. 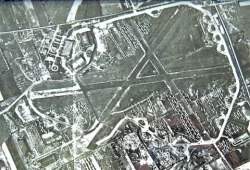 After the war had finished the airfield was as a giant storage area for unwanted airframes. No12 MU remained at the airfield until 1960 when the last aircraft to leave was a Gloster Meteor NF14 and the airfield was closed by the RAF. The image shows the airfield in 1947 when the airfield was packed with nearly 1200 airframes, credit wise it's from a 'local paper' any more details or specific credit welcome, as are any old images from the airfields history.